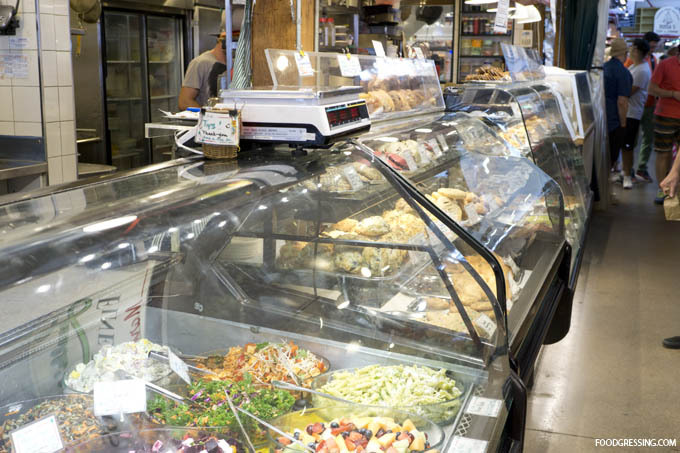 Laurelle’s Fine Foods is a vendor at the Granville Island Public Market that has got one mesmerizing food display case. I swear I have walked back and forth around the display case a few times before I could decide on what to try. 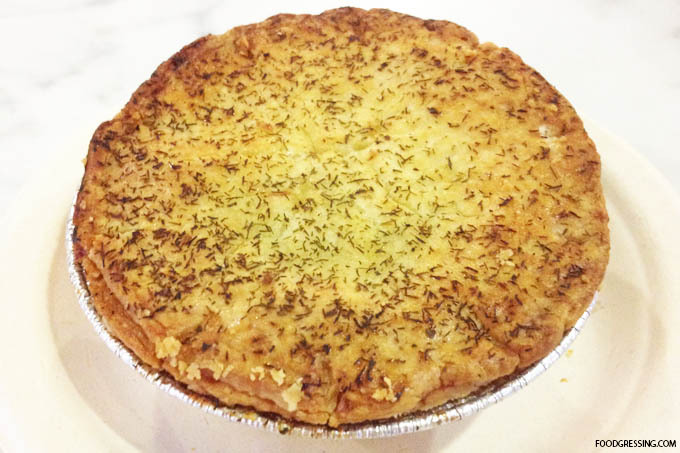 Laurelle’s has lots of homemade style options for eat-in or take out including savoury pies, pastries, and pastas. Got a sweet tooth? 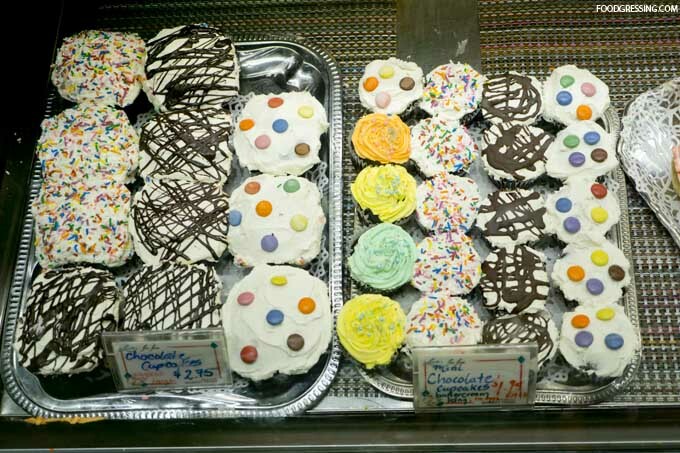 You will undoubtedly find some delectable goodies like brightly coloured cupcakes, chocolate covered rice krispies and sugar cookies. 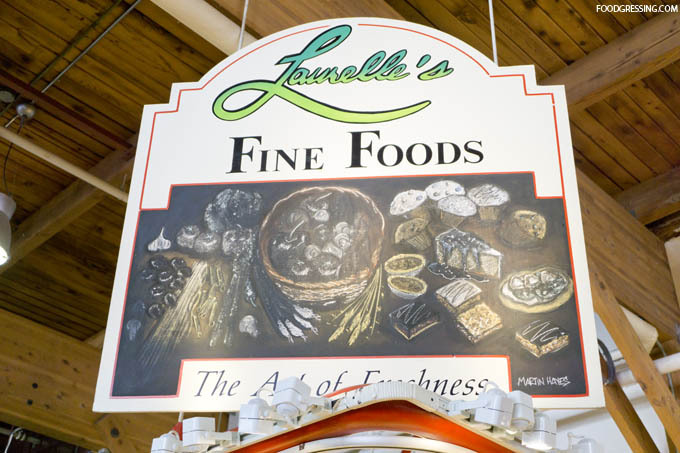 I have tried Laurelle’s Fine Foods twice in the past year. The first time, I ordered a wild salmon pie ($5.25) made with onion, spices, lemon and dill. It was pretty good with a nice, buttery and flaky crust. The salmon taste was not too overpowering which was nice. 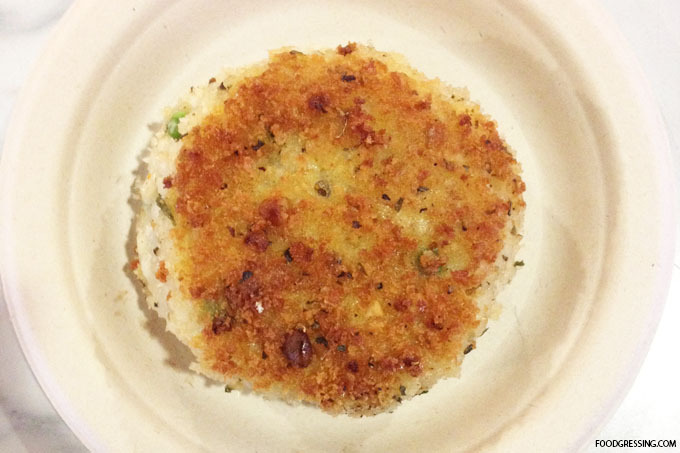 The risotto cake was another item I had from Laurelle’s and it was deliciously crispy and brown on the outside. 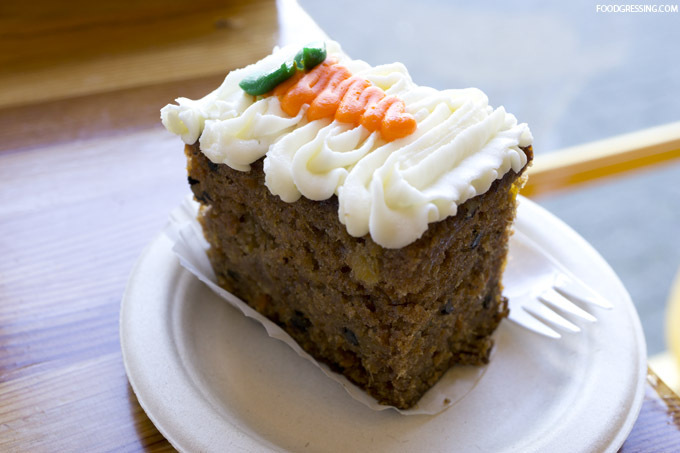 The carrot cake ($3.95) with cream cheese and icing was pretty, moist and decently tall and thick for the price. 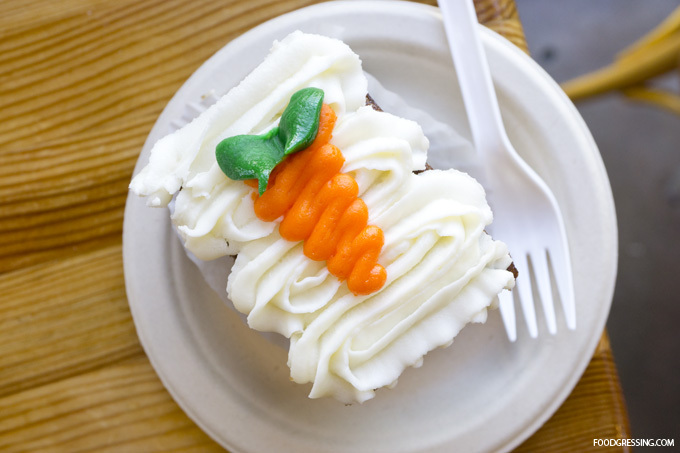 I thought it was cute how they have a little carrot on top of the carrot cake. It had just the right amount of sweetness. 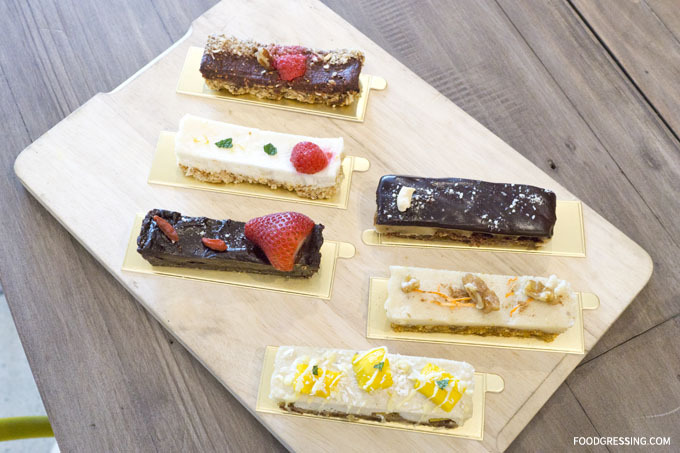 Disclosure: I was invited by MELU Juice and Health Bar to attend a tasting session. All opinions are mine alone. 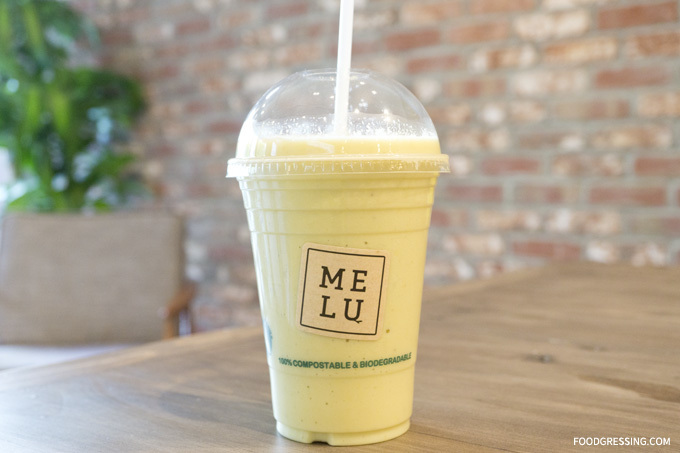 MELU Juice and Health Bar opened this month in Coal Harbour and is the area’s first premium cold-pressed juice and health bar. 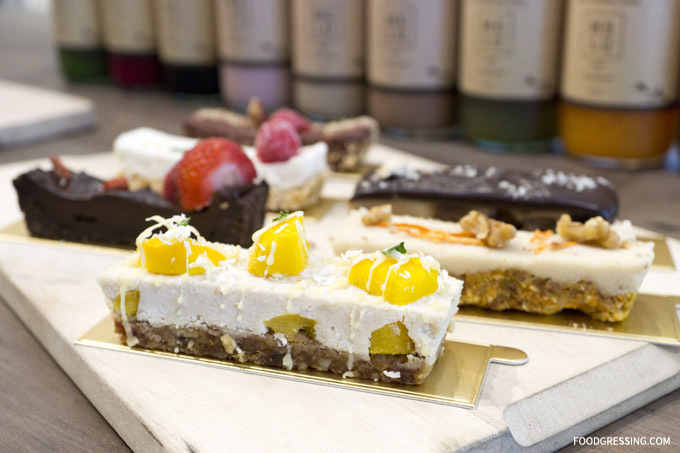 At MELU, it’s about unique ingredients, creative recipes, nourishing meals and guilt-free desserts that are so good you’ll be wanting more. 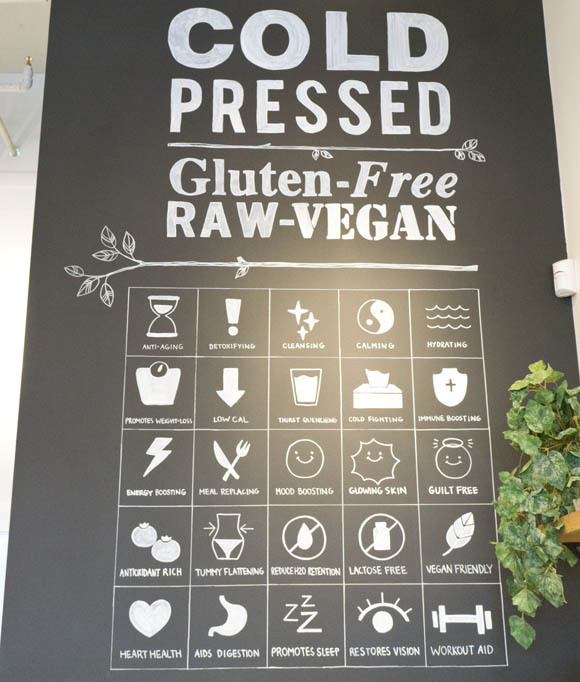 Aside from cold-pressed juices, MELU has other raw, unpasteurized, vegan, and gluten-free options including nut mylks, smoothies, detox waters, salads, overnight oatmeals, and health bars (more on that below). I spent an afternoon with co-founder, Angela Luo, where we had a fun and *guilt-free* tasting session and discussed MELU’s concept and offerings. MELU’s naturally formulated cold-pressed juices are created in-house and use 2 – 3 lbs of fresh vegetables, fruits, and roots. Some unique ingredients used include jicama, bamboo charcoal and winter melon. 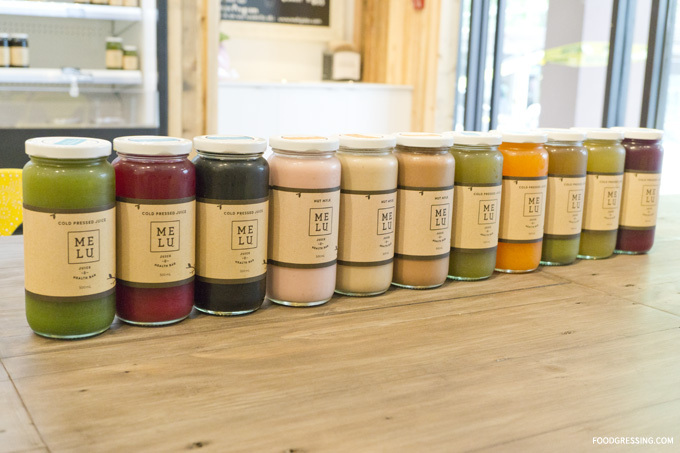 MELU currently offers 8 cold-pressed juices flavours, 4 nut mylks and 4 smoothies including Berry Beetiful, Grapefruit Heartbeet, The Pink Elephant, and Cacao Monkey. The juices retain high nutritional content by processing them using the cold-pressed method. 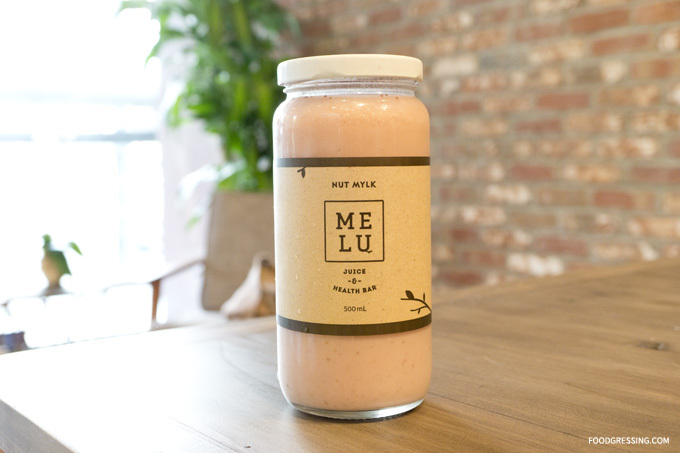 Furthermore, MELU’s juices have benefits include mood boosting, glowing skin, and promoting weight-loss. To understand the health benefits of each type of juice, MELU has developed an easy-to-understand guide which is seen on one of their walls. The benefits of each juice can be easily found on the back of the bottle. 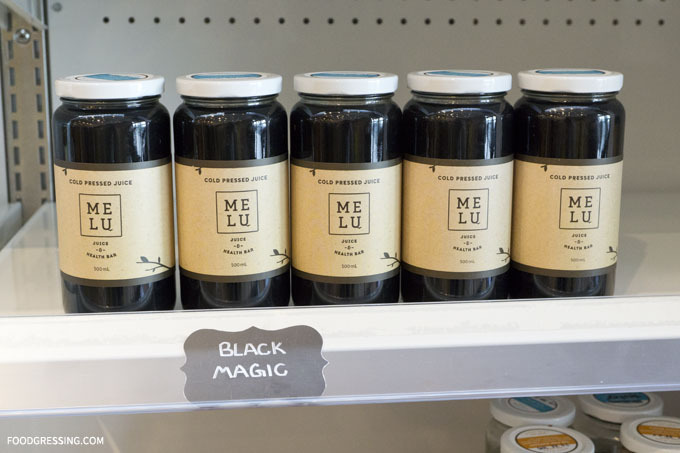 After sampling all of MELU’s cold-pressed juices, my personal favorite is the Black Magic. The black colour of the juice was not appealing at first, but I surprisingly enjoyed the flavour. It contains activated bamboo charcoal but has a citrus flavour as it includes lemon. Other ingredients include cayenne, Himalayan pink salt and agave. In regards to MELU’s nut mylks, they were smooth and sweet. Chocolate lovers like myself would no doubt enjoy the Cacao Monkey. The Pink Elephant is a fun summertime flavour with strawberry, raw vanilla bean, agave nectar, and Himalayan pink salt. I also enjoyed The Cob smoothie which has corn, house-made cashew mylk, banana, and avocado. The fusion of flavours from the ingredients made a delicious, rich and only slightly sweet drink. 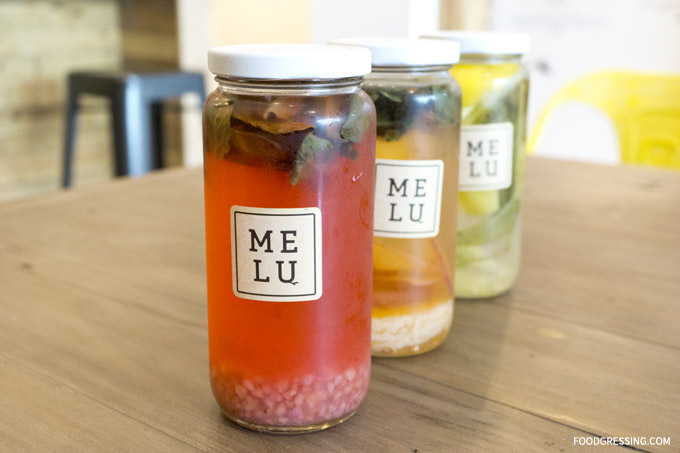 MELU just announced their juice cleanse programs available as 1, 3 or 5 days. The detox waters are rich in flavor like cold pressed juices and but not as thick as smoothies. Who knew that they would also be that pretty? 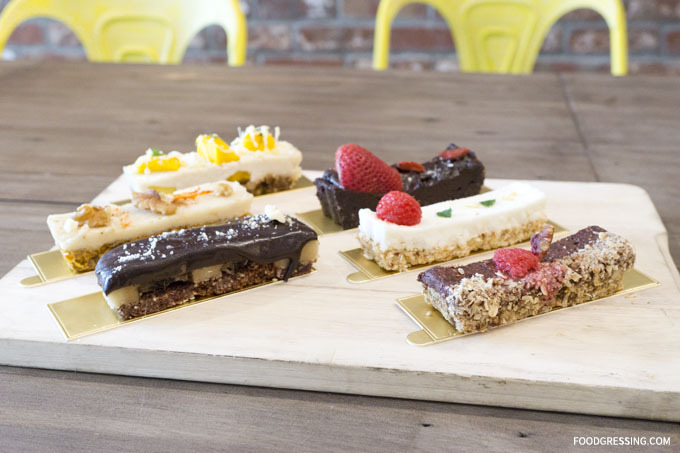 The Instagram universe is abuzz with MELU’s eye-catching yet healthy and delicious health bars. These bars are not heated or baked to retain the utmost nutritional content without any added sugar, addictive, or preservatives. I loved the Mangolicious bar, which had mango, walnuts, almonds, cashews, coconut mylk, shreeded coconut, dates and agave nectar. It was just subtly sweet with mangos on top. Other yummy bars include Kind of a Fig Deal, Frosty the Carrot Cake, Cold Brewhaha and So Fudgin Good (a must for chococlate lovers!). 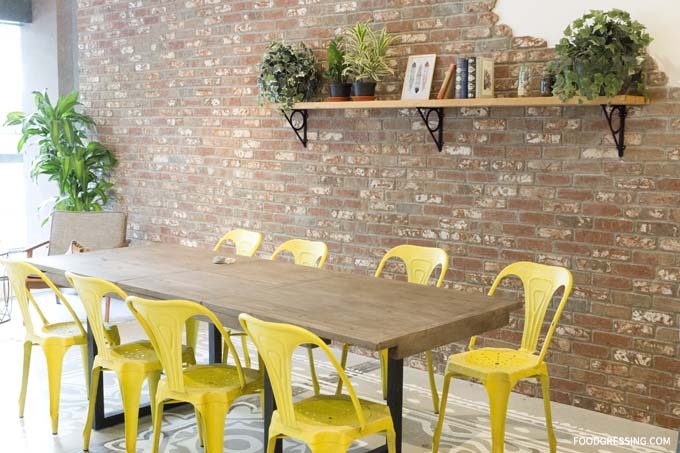 MELU’s clean bright space includes a torn up brick wall (for artistic purposes) and a painted rug. 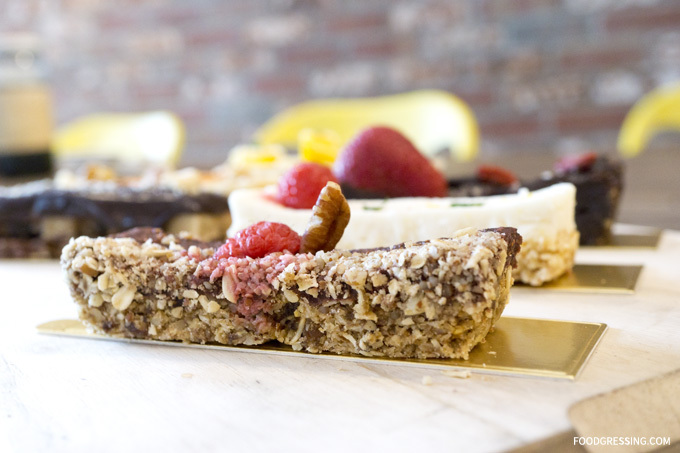 MELU Juice and Health Bar has some creative, delicious yet nourishing offerings in today’s busy and demanding world. 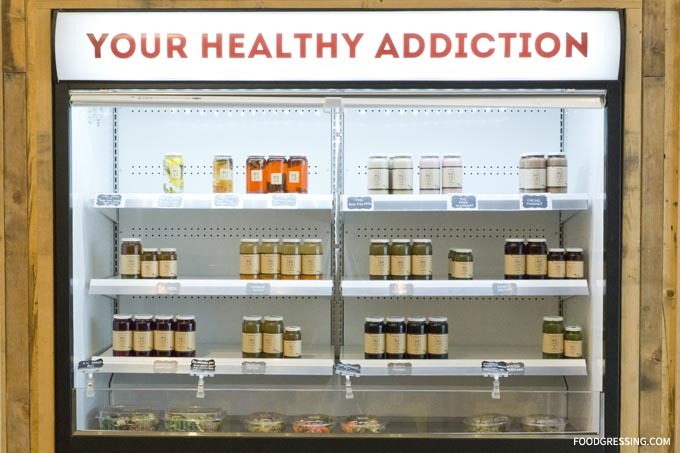 Their mission to deliver a healthy alternative to fast food is on the right track. MELU’s health bars are sinfully tasty, but you can happily eat them without regret. 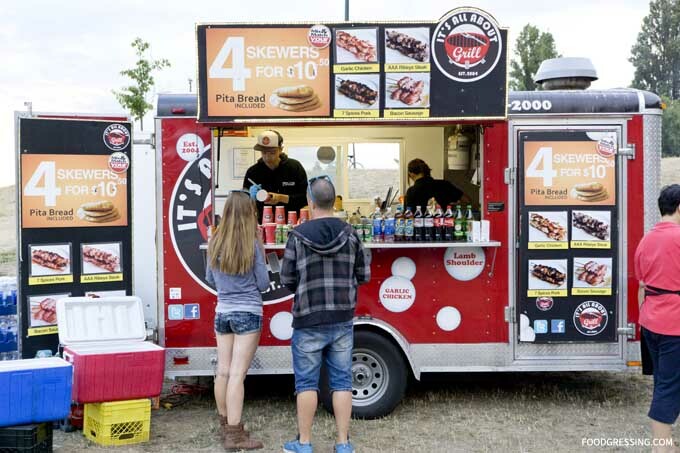 On Saturday, we headed to Sunset Beach Festival held as part of the Honda Celebration of Light. There was live music, giant board games, and various booths with giveaways and contests. 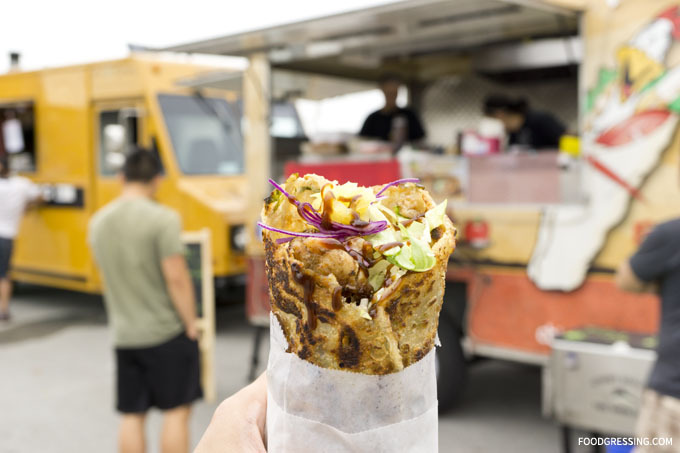 There were just a few food trucks at the festival. The tempting smell of the skewers from It’s All About Grill drew me and my husband in, so we decided to give it a try. 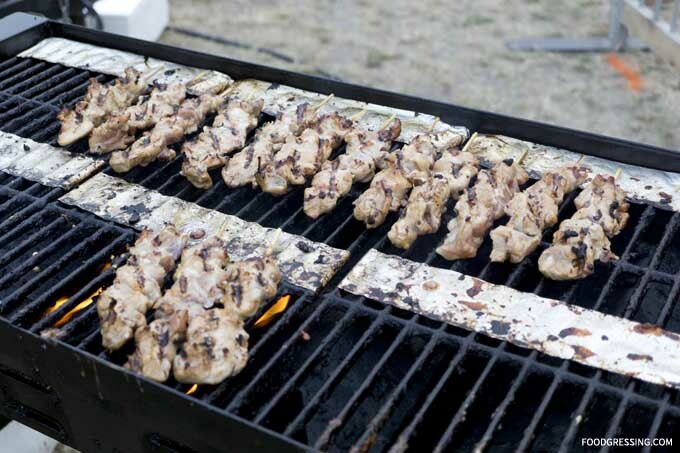 It’s All About Grill offers 4 skewers and a piece of pita bread for $10.50. 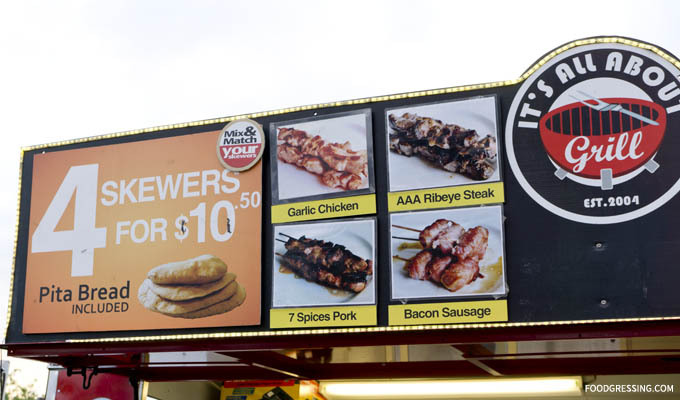 You can mix and match among the four different flavours: garlic chicken, AAA ribeye steak, 7 spices pork and bacon sausage. We ordered four skewers in different flavours, which were presented in a cup with pita bread and a piece of cucumber. It was not very busy at the time, so we got our food fairly quickly. My favorite was the 7 spices pork because it had a nice amount of seasoning and the meat was tender and juicy. 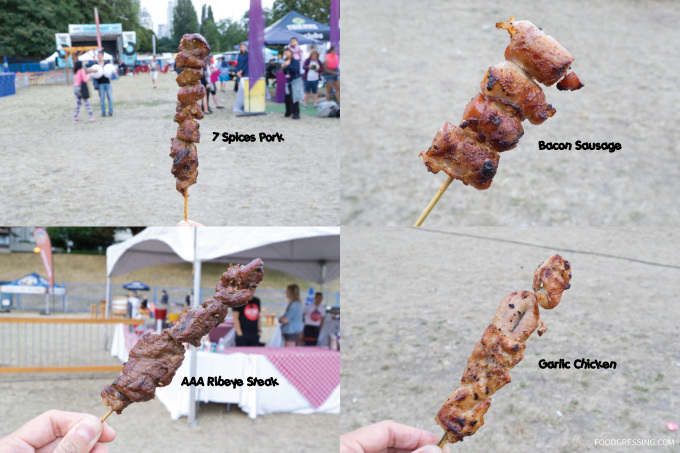 I liked the presentation of the bacon sausage skewer, and the flavour was just okay. The AAA ribeye steak was unfortunately very tough. The garlic pork was tender but did not have much garlic flavour. 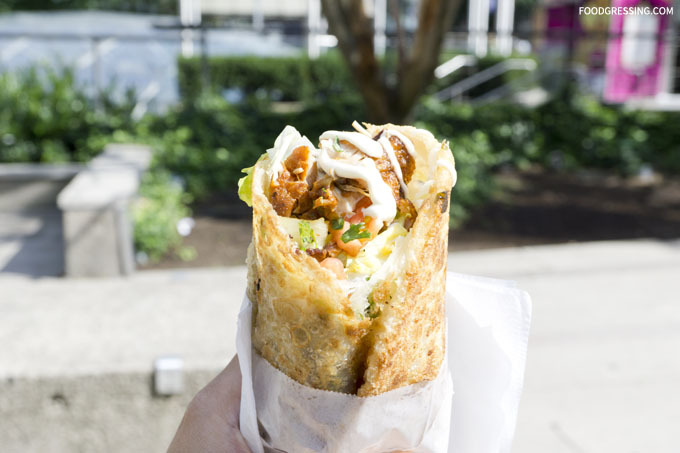 If you don’t know about Gastropost Vancouver, it is a weekly food-related spread in the Vancouver Sun and The Province. The spread is put together using photos contributed by foodies based on that week’s mission. 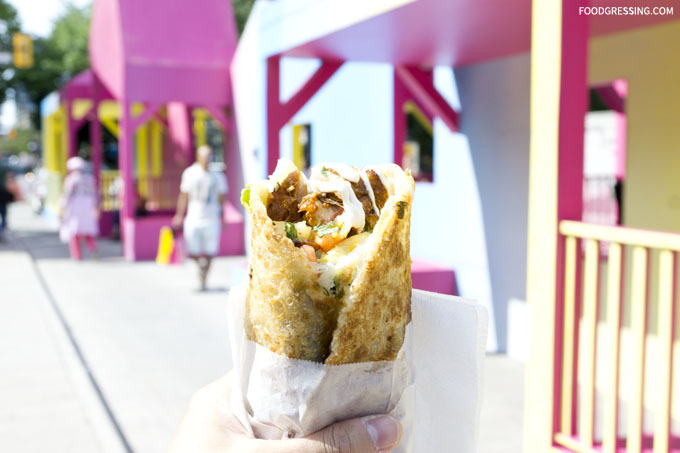 Gastropost is also available in three other cities in Canada: Edmonton, Calgary and Toronto. They recently celebrated their upcoming 100th mission with a party at Yew Restaurant in the Four Seasons Hotel. 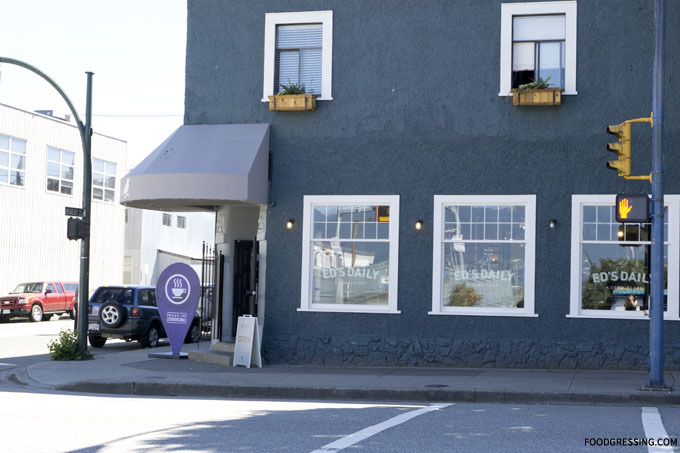 There was delicious food (lots of it, of course), contests, an appearance by Yew’s Executive Chef Ned Bell and even some learning about Oceanwise seafood and sustainability. 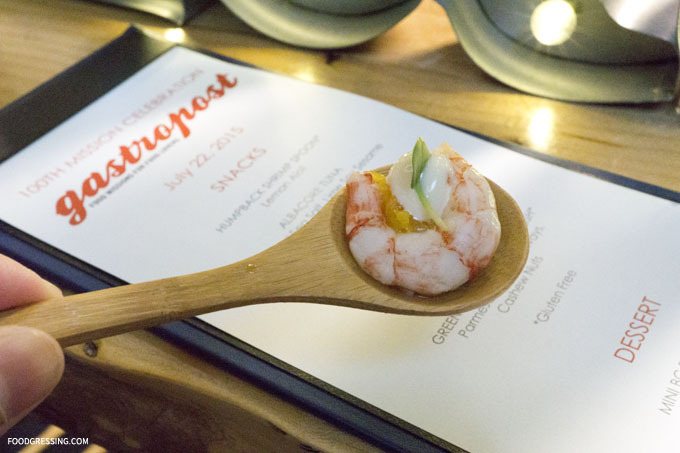 The humpback shrimp was served on an Oceanwise logoed spoon. Simple, elegant and sustainable! The humpback shrimp is in fact a sustainable shrimp species. 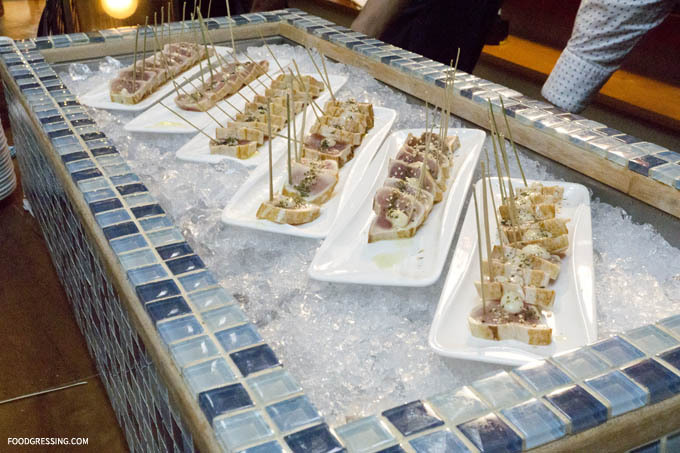 There was perfectly seared albacore tuna with smoked sea salt and lime soy sesame. 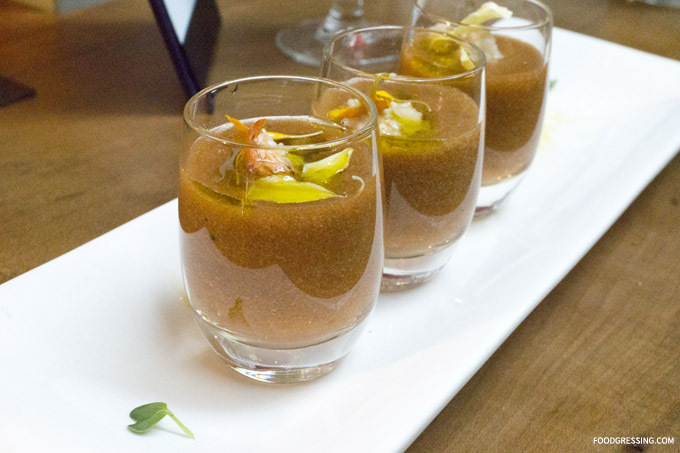 I loved the zesty heirloom tomato gazpacho. It was refreshing and cool for a warm summer night. 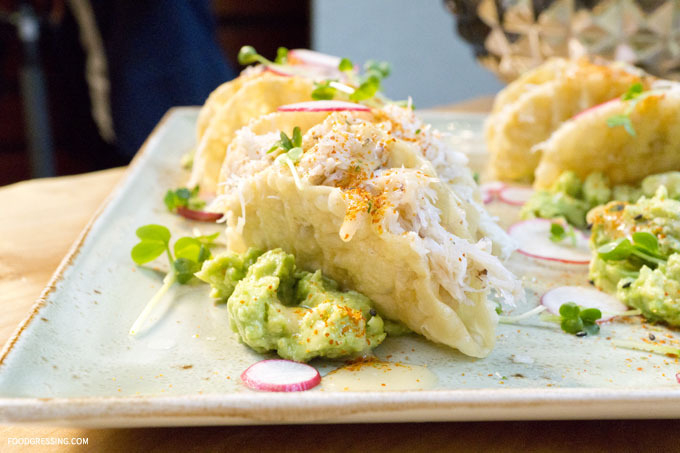 The dungeness crab tacos were out of this world not only in presentation and taste. It was zesty, sweet and really *delicious*. I even found the Chef Ned Bell’s recipe here. 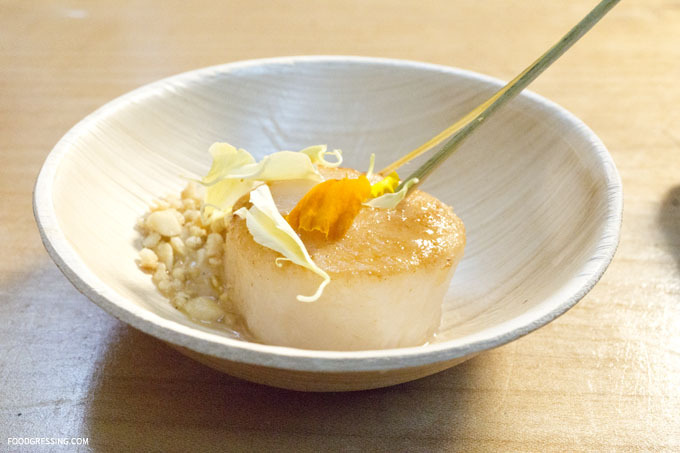 The seared scallop was juicy and I loved the elegant presentation. 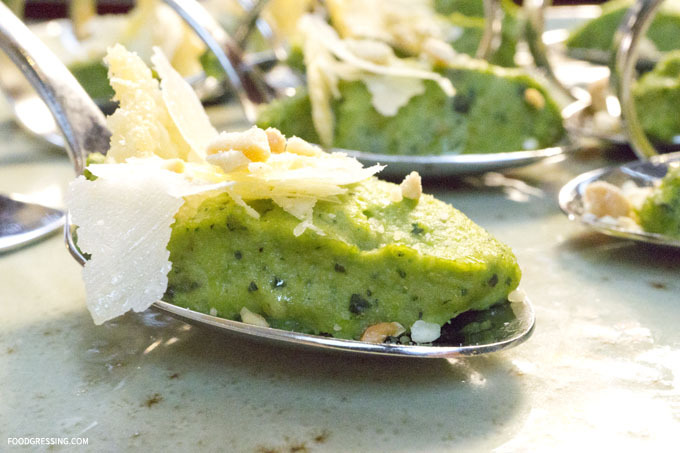 I absolutely enjoyed the green garbanzo bean relish with parmesan cheese and cashew nuts (yes, I had several of them). I loved the mix of flavours from the chickpeas, cheese and nuts. There were a lot of fun textures as well. For dessert, there was the mini BC Blueberry tart with vanilla soft-serve. There were a variety of beverages served including Yew’s ginger mango peach and berry iced tea, Fresita sparkling wine, and Samual Adams beer. The Gastropost Vancouver party was a ton of *foodie* fun, and it was great to finally meet people in person (you know how it is with social media nowadays). For more on participating with Gastropost Vancouver, check out http://vancouver.gastropost.com/. On the outside, Molli Cafe looks like your neighbourhood coffee shop. 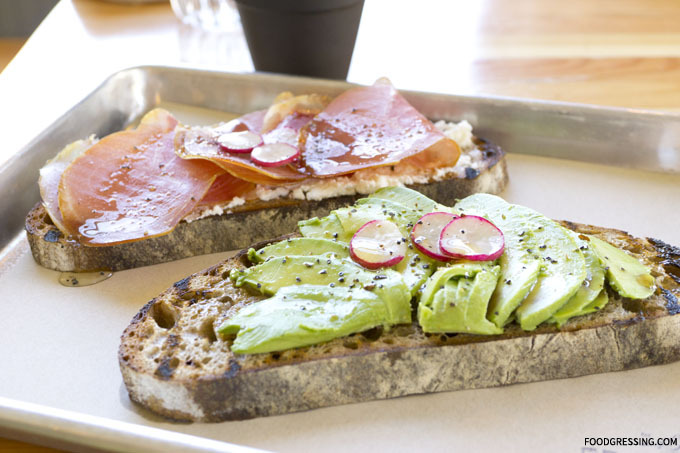 In fact, it had taken over the space of the Green Mango Cafe, which served your typical paninis, wraps and sandwiches. I regularly walked by Molli Cafe and thought that the offerings would more or less be the same. It wasn’t until I stopped by one day and looked at the menu posted on their window that I realized it was not a regular coffee shop. In fact, I was quite surprised to learn that they serve Mexican food – tacos, tortas and soups! 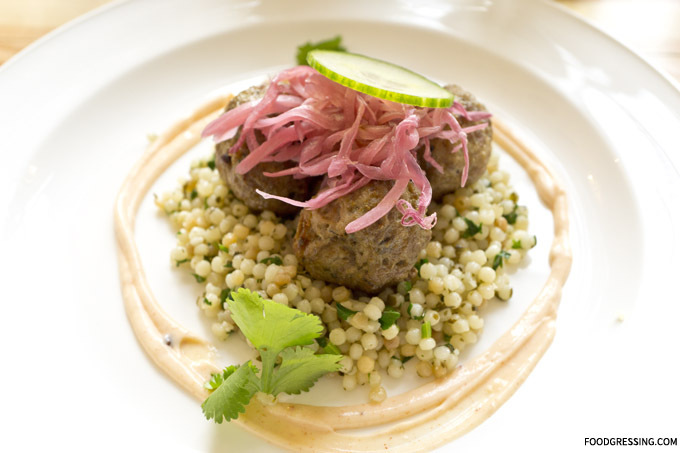 A few articles online give insight on the chef owners’ fine-dining background. Originally from Mexico City, chefs Rafael Flores and Bernice Balbuena have worked at top fine-dining restaurants in the world (think $400 per person). Chef Rafael’s resume includes working at the (now closed) El Bulli, the number one restaurant in the world for many years. Chef Bernice worked at El Celler de Can Roca, a three Michelin-starred restaurant in Spain. 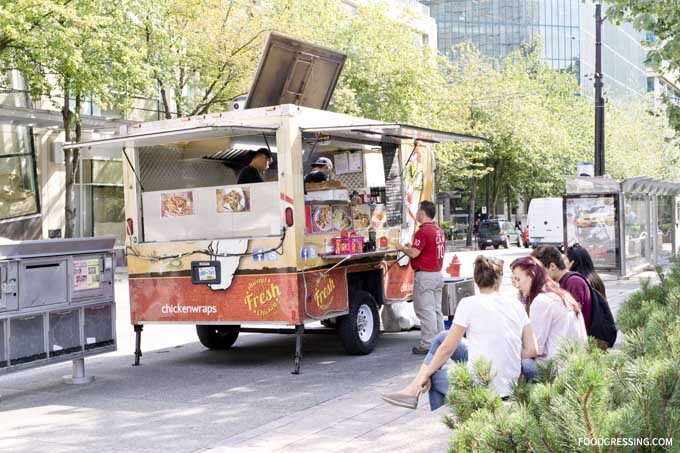 In Vancouver, they have worked with executive chefs from Tableau, Raincity Grill and Diva at the Met. 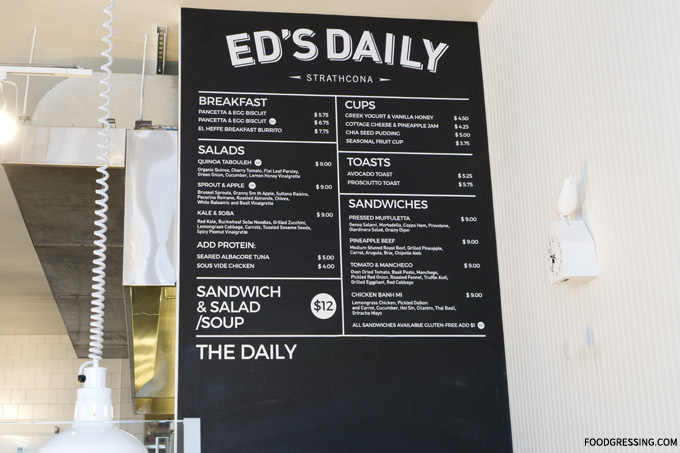 Together they came to this city to live the “Canadian Dream” and opened up this humble cafe in Downtown Vancouver. Molli Cafe’s menu is small and presented on a chalkboard on the wall. 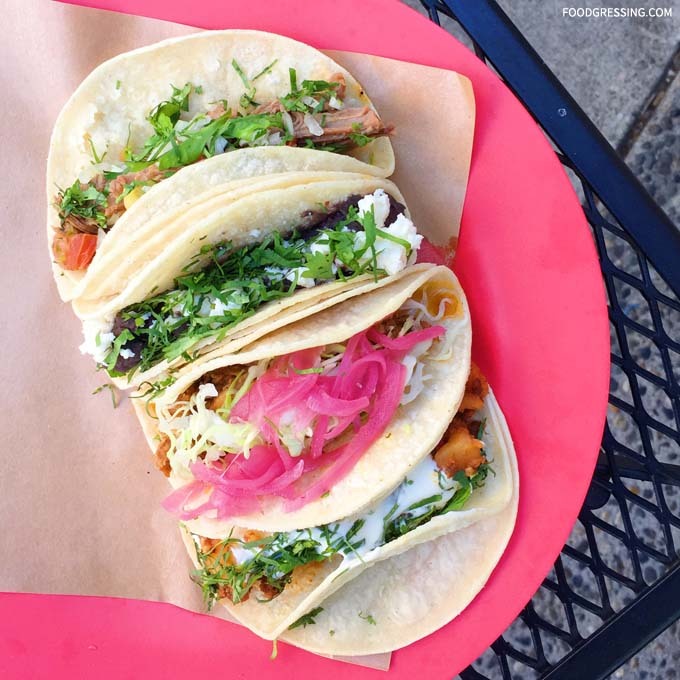 The owners liken their menu offerings to Mexican street food. They serve Mexican soups (~$5), breakfast items (~$7-$9), tacos ($2.50) and tortas (~$9). They try to stay closely authentic as possible despite the limited Mexican ingredients available in Canada. Photos of the menu are available on Zomato. The cafe is small with lots of natural light from the floor-to-ceiling windows. There are high top tables, small dining tables and two tables outside. My preference is to sit at one of the tables outside not only to people watch but because there seems to be no air conditioning inside. On one occasion, I ordered all four types of tacos on traditional corn tortillas ($2.50 each): cochinita pibil (pork), res a la mexicana (beef), frijol con queso (slow cooked beans), and papas con chorizo (housemade chorizo). All of them were flavourful and had the good amount of seasoning. I love a pulled pork taco and the cochinita pibil was just right in my books. 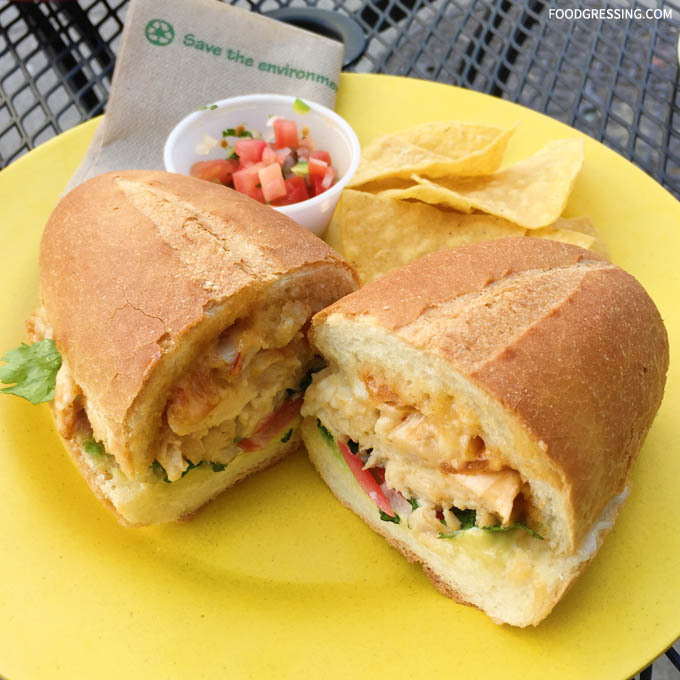 I also tried the pollo tortas ($9) which was pulled chicken served in a locally baked Portuguese bun. The Portuguese bun is the closest to what they can find locally to a Mexican bolillo bun. I liked the crunchiness of the bun with the tender, meaty filling. The chicken tortas is apparently not traditional in Mexico, but the owners adapted it for local tastes. 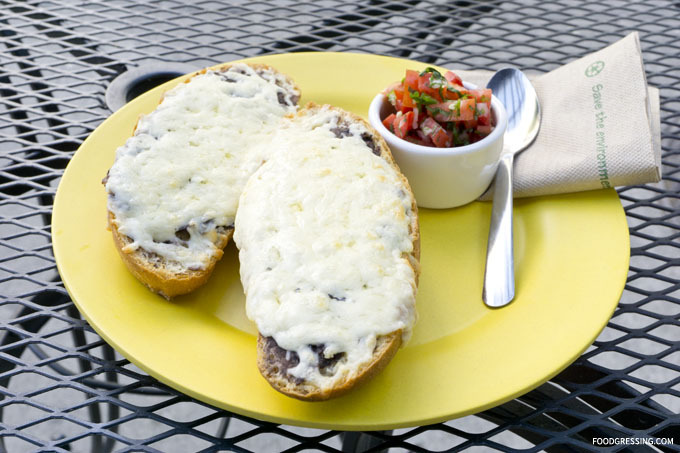 The breakfast item I tried was the mollete ($7.25), which had two open-faced buns with refried beans and cheese on top. The salsa that came with it was fresh and had bright flavours. 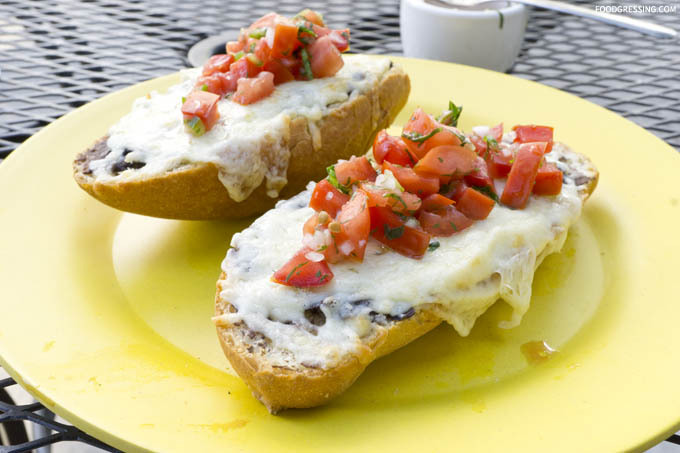 The mollete was a fun dish with different flavours and textures from the beans, cheese and salsa. The kitchen at Molli Cafe is small, so it does take a bit longer to get the food. A staff member did check on me during the two times I was there. Menchie’s in Yaletown opened last month, and I have made a few visits already. It has been several months since my last Menchie’s fix at the Cambie location. They are having a grand opening this Saturday, July 25th, where they will be giving away free frozen yogurt! More details below. I first visited Menchie’s in Yaletown a few days after they opened. They are located on Davie between Richards and Homer. This location is quite small with counter top seating but no dining tables. There is also a high chair available for kids, which I did use for my son. 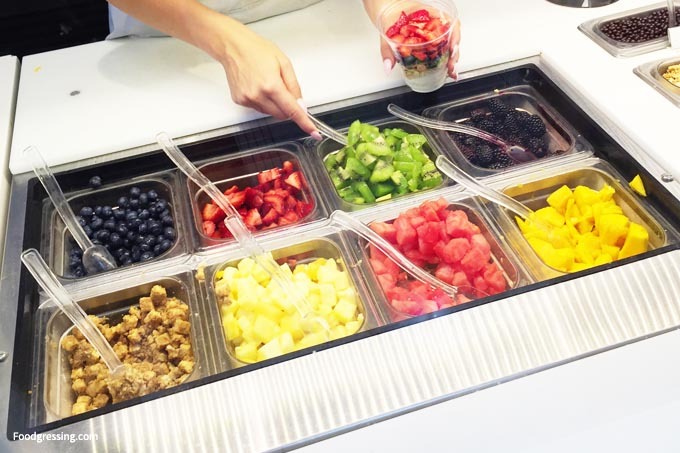 They have 10 rotating daily flavours along with more than 40 toppings including fruits, candies and nuts. Unlike Pinkberry, they charge by weight at a cost of $2.19 per 100 grams. I heard that they had the Nutella flavour via social media and was eager to try it. It had been a while since I had something with Nutella on it and I definitely missed the taste. We decided on a classic vanilla and Nutella swirl with gummy bears, fuzzy peaches and peanuts. The cost was close to $6. A few days ago, I visited Menchie’s again in Yaletown with my friend and husband and this time we and had a celebrity encounter. I recognized Hollywood actress Andie MacDowell as she was getting her cup of froyo that evening. Her show, Cedar Cove, is filmed in North Vancouver apparently. We did not stop her for photos or autographs, but she talked to my husband briefly as he was watching my friend’s dog outside. Andie even petted the dog because she thought the dog was cute! 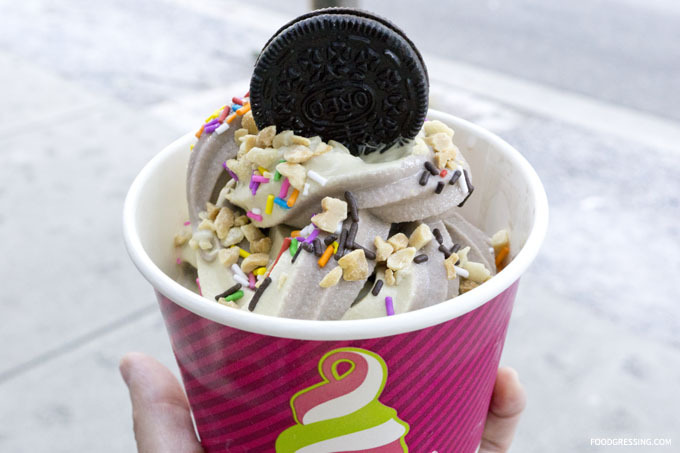 I decided on the Oreo, which is a new flavour at Menchie’s in Canada, and a zen green tea swirl. For toppings, I had the chocolate sprinkles, rainbow sprinkles, peanuts and an Oreo cookie on top. The green tea yogurt was a bit runny unfortunately. The yogurt cup cost close to $10. 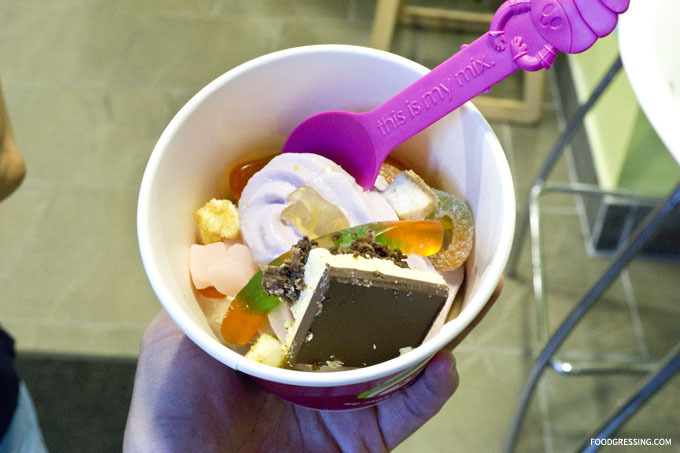 My friend went with a blueberry cheesecake froyo with gummy bears, gummy worms, strawberry mochi, and a Nanaimo bar. My friend thought the gummy bears were a bit hard. Her cup came out to be around $6. The staff at the new Menchie’s Yaletown seemed quite nice. They were eager to give my son stickers the times we were there. On our first visit, the owner thanked us for coming and even helped keep the door open for us as we left with our stroller. One of the staff handed me an advertisement which had information about the Grand Opening this Saturday. 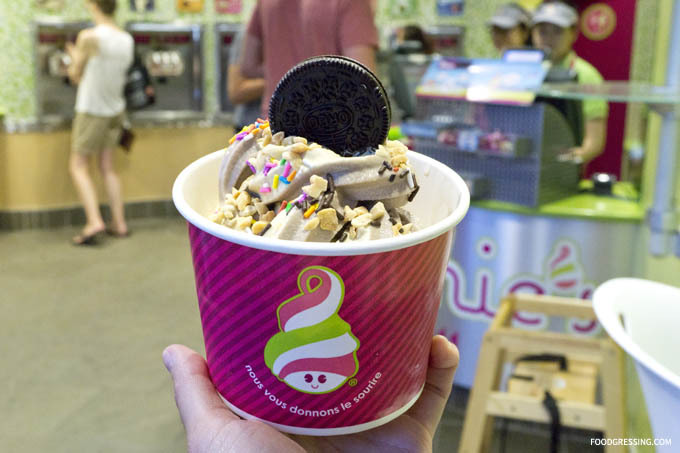 The Menchie’s in Yaletown has a good rotating selection of froyo flavours and toppings. I also enjoy the friendliness of their staff. My green tea froyo was a bit runny and we found the gummy bears to be hard, but the overall experience has been good. 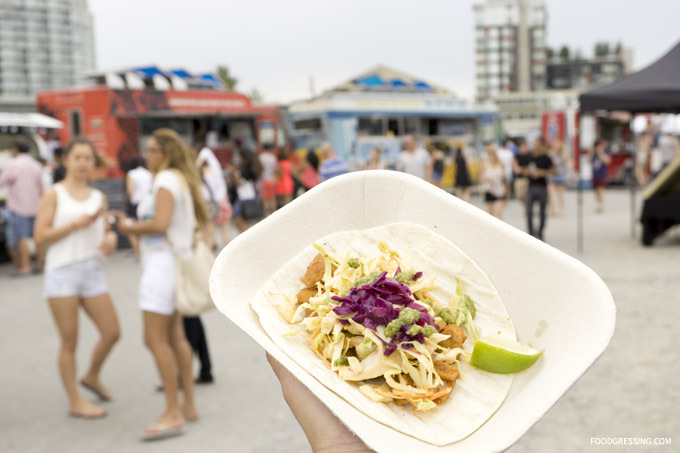 A Korean taco is what happens when you give a Korean twist to a Mexican taco. 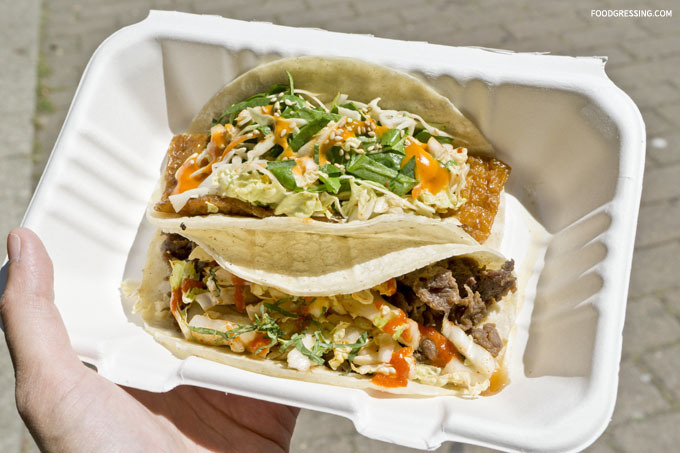 The Korean taco originated in Los Angeles where it became a popular street food dish. 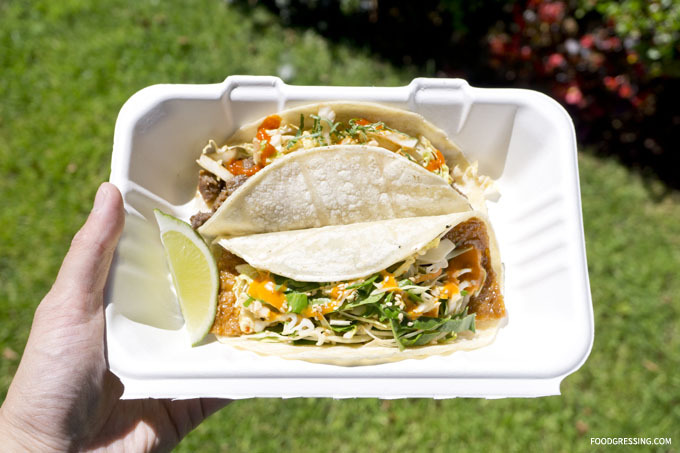 The concept is to have Korean BBQ ingredients, like bulgogi and kimchi, on top of Mexican flour tortillas. 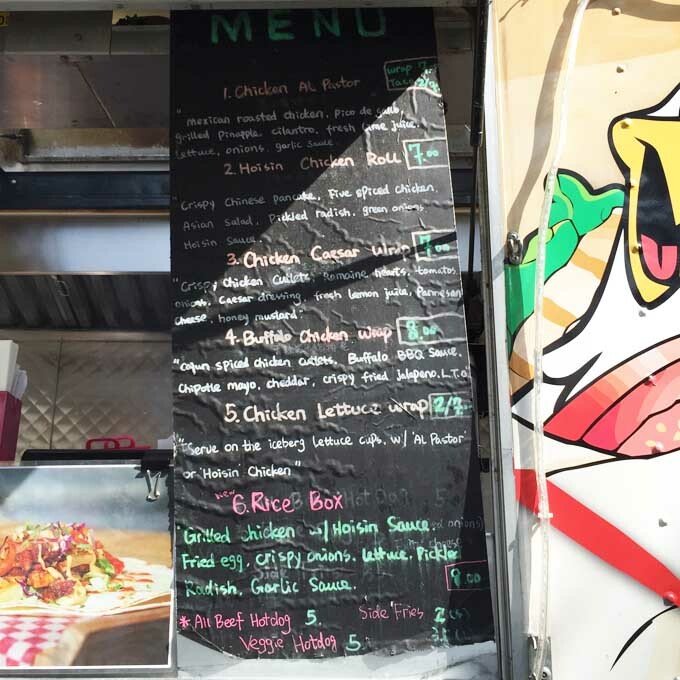 Disco Cheetah is a food truck that has been serving this Korean-Mexican fusion dish on the streets of Vancouver. I first tried Disco Cheetah at the media event for the Food Cart Festival. I was instantly drawn to Disco Cheetah’s bright yellow food truck and I was intrigued by the idea of Korean-Mexican fusion. 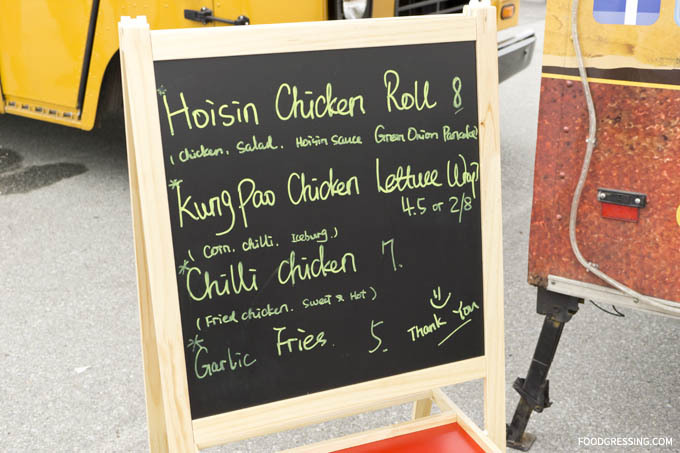 They also had a table set up in front of their food truck for taking orders and payments. 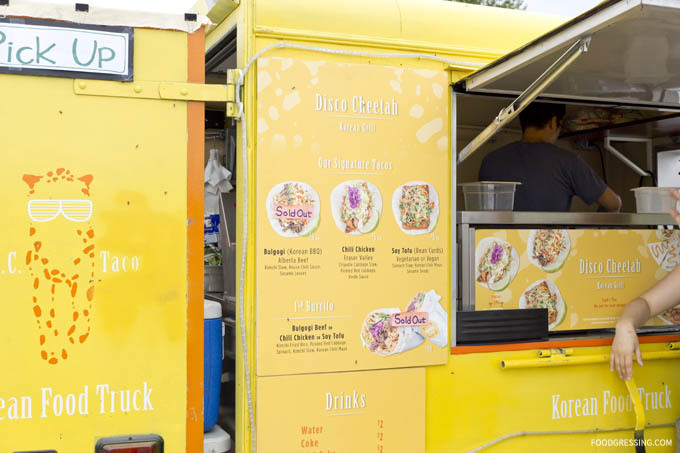 Disco Cheetah has three signature tacos for $5: bulgogi beef, chili chicken and soy tofu (vegetarian/vegan option) which are served on soft gluten-free tortillas. 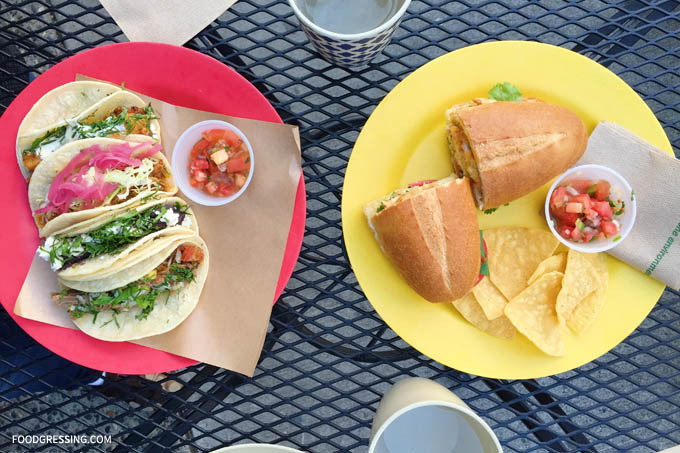 You can also get two tacos for $9. Using a food voucher I was provided as part of the media event, I tried the chili chicken Korean taco from Disco Cheetah. It had chipotle cabbage slaw, pickled red cabbage, verde sauce and a lemon wedge. The chicken was local from the Fraser Valley. The filling was on the sweeter side and flavourful. It had bold and vibrant colours, which gave it a great presentation. The taco tasted pretty good but I felt that it was on the smaller side for $5. I would have liked it to be more juicy for added flavour. While I was shopping at the West End Farmer’s Market, I noticed that Disco Cheetah was there. I decided to try out their two other taco flavours for $9. I tried the bulgogi (Korean BBQ style) taco made of Alberta beef, kimchi slaw, house chili sauce with sesame leaves. The taco tasted sweet overall due to the sweet chili sauce. It did not feel juicy enough for me. The other taco I had was the soy tofu (bean curd) taco with spinach slaw, Korean chili mayo, and sesame seeds. This is the vegetarian/vegan option. The bean curd offered an interesting texture to the taco. It also had a similar sweet taste like the other tacos. While I have indulged in Menchie’s frozen yogurt a few times, I have never tried Pinkberry before. When I saw the Pinkberry Groupon deal for $5 for $10, I decided to buy it and give them a try. 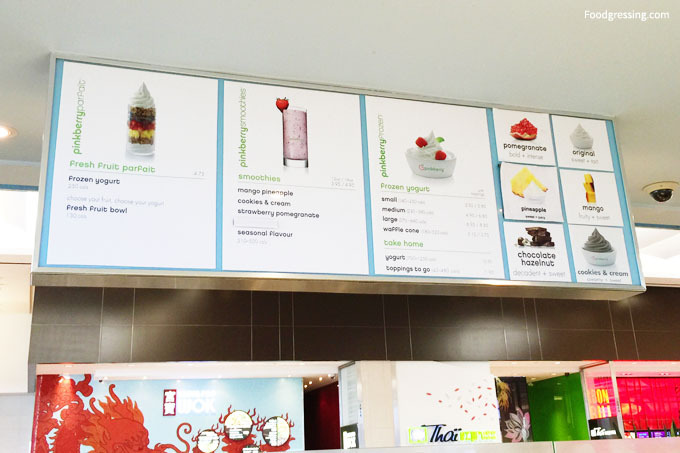 4 out of the 5 Pinkberry locations in Canada are in B.C. alone: Park Royal, Richmond Centre, Metrotown and High Street Abbotsford. The remaining location is in Alberta. I headed to Richmond Centre to redeem the Groupon deal with a friend. Frozen yogurt should not be considered a health food. 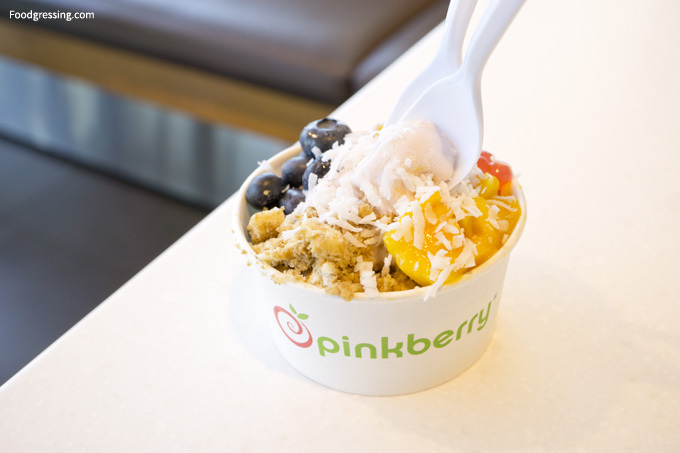 Pinkberry advertises that they use fresh-cut fruit and no added water or fructose syrup to their yogurt. What they do not report obviously is of their use of emulsifiers, acidifiers, preservatives, and fillers (just sayin’). Frozen yogurt is a highly processed product even though Pinkberry’s original tart flavour has been noted as having a *natural*, sour greek yogurt taste. 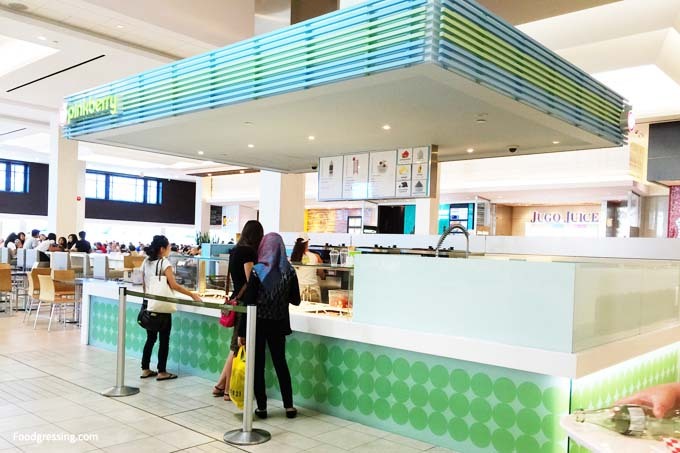 The Pinkberry at Richmond Centre is in a stand-alone booth in the middle of their second level dining terrace. 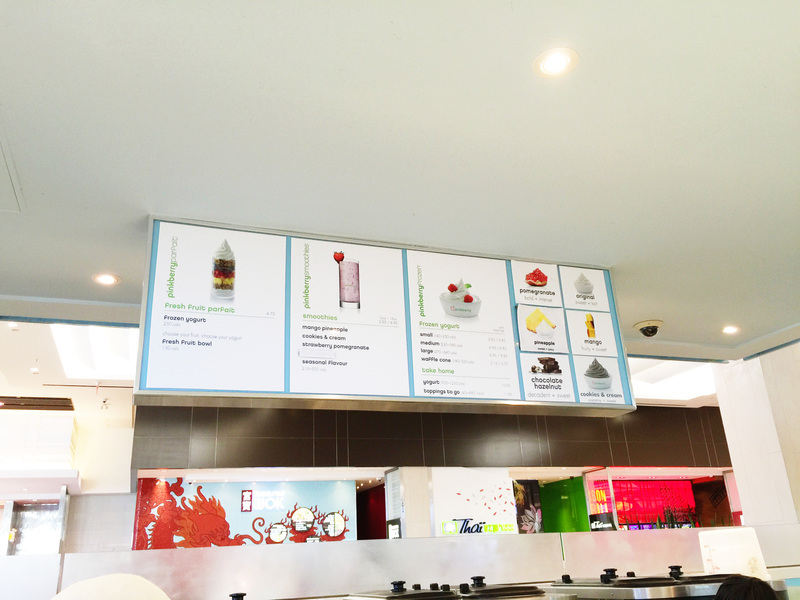 The appearance of the booth is in line with the Pinkberry brand – clean, chic and modern. The frozen yogurt comes in small, medium and large. 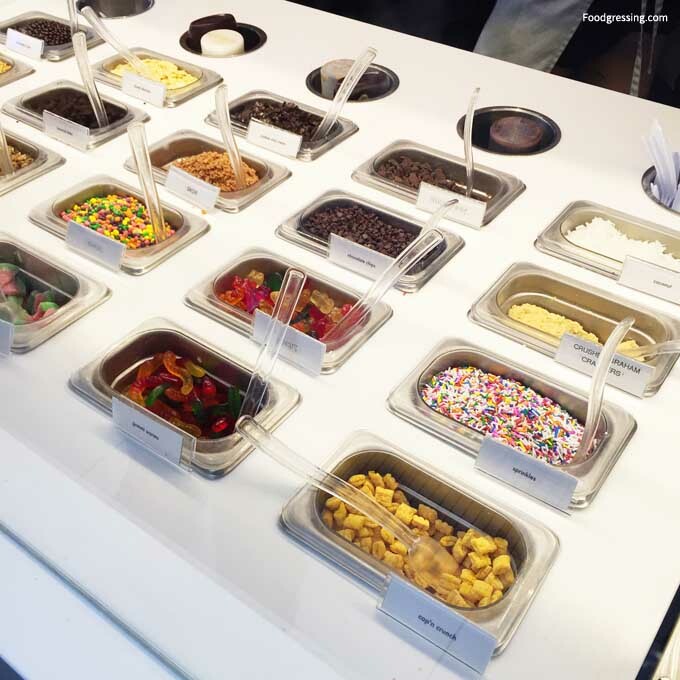 The cost ranges from $4- $6 for yogurt alone or $6-$9 with toppings depending on the size. You can get as many toppings as you want providing that they fit in the bowl – that is, they have to fit nicely surrounding the yogurt peak. They also have yogurt ($11) or toppings ($2) to take home. Smoothies are $4 for a 12 oz and $5 for a 16 oz. 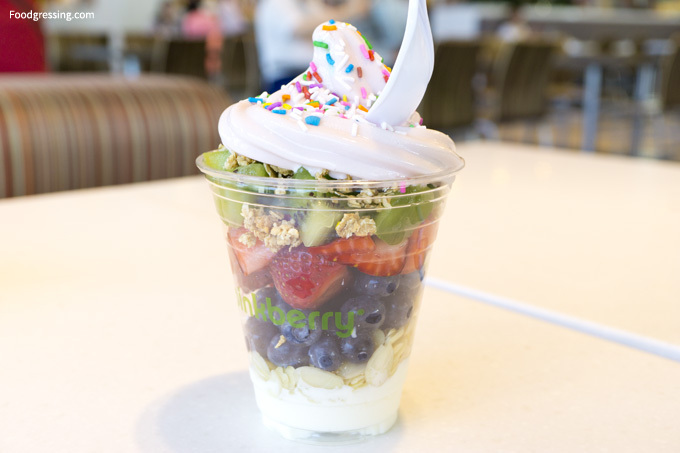 A frozen yogurt parfait or a fresh fruit bowl is $5. There are fresh fruit toppings. Other dry toppings include sprinkles, gummy works, coconut flakes etc. As I approached the booth, a girl working there asked me if I would like to try some samples. Unfortunately, they ran out of their original flavour. The next closest in taste to the original was the pomegranate. It was light and a bit on the sour side, but still tasty. I also tried the pineapple yogurt, which I found to be very bold and “citrusy”. We decided on a small frozen yogurt with toppings ($6) and a frozen yogurt parfait ($5). For the frozen yogurt, we had the pomegranate flavour, which apparently is 100% California grown pure pomegranate juice. Toppings include strawberry and mango boba, blueberry, mango, cheesecake and coconut flakes. For the frozen yogurt parfait, we had the following layers: pineapple yogurt, toasted almonds, blueberry, strawberry, kiwi, granola and topped with final layer of pomegranate yogurt and sprinkles. I found the student-aged staff there to be surprisingly friendly. The girl who prepared our treats was not stingy and packed on the toppings as much as she could. She was patient with us as we were undecided on the toppings. I found the frozen yogurt parfait to be of better value than a small yogurt cup if you just want fresh fruit with frozen yogurt. You can fit in some nice layers of fruit in the parfait rather than packing them rightly in a small cup. 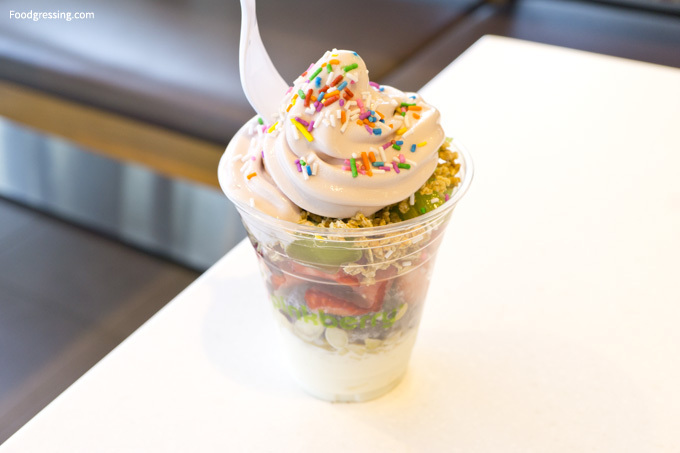 The parfait is about $1 less than a small yogurt cup with toppings. They ran out of the original yogurt flavour but the pomegrante was a good substitute. I was impressed with the friendliness of the staff at Pinkberry Richmond Centre.